The Fragile Mind: How it Has Produced and Unwittingly Perpetuates America’s Tragic Disparities, by Doctor Jarik Conrad is part autobiography and part research findings. Written in a tone and at a pace that a college professor or a high-school graduate can follow, the book tackles the long-standing issue of racial disparities in America. From his adolescence in East St. Louis, IL. to his young adulthood in Jacksonville, FL; Dr. Conrad takes the reader along on his journey of human relations enlightenment. The root of The Fragile Mind is the Cultural Dynamics Model. Dr. Conrad describes the model as a description of the relationship between the dominate cultural (whites) and the non-dominate culture (blacks). 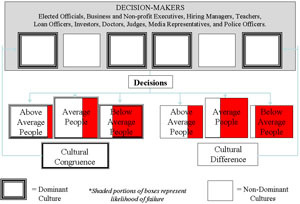 The Cultural Dynamics Model illustrates a system of racial bias where the culture of dominance unconsciously acts in such manner to maintain their dominance, while the non-dominant culture unconsciously acts to maintain their subdominance. The issue of unconscious bias, presented in the Fragile Mind, is fueled by the concept of Persistent Traumatic Stress Disorder(Persistent-TSD), as explained by Dr. Conrad, is a disorder similar in nature to post traumatic stress syndrome (PTSD). Soldier exhibit symptoms of PTSD, such as depression and anxiety, after they return home from war. Dr. Conrad contends that Persistent-TSD is a result of living in poor, urban communities that are mirror-images of a war-zone or battlefield. In this environment the line between good and bad is is blurred and the difference between right and wrong is difficult to navigate. Those who grow up in these surroundings literally step outside of themselves and become someone else in order to survive. In an effort to connect with my pupils at Heritage College, where I teach business management, I eagerly consumed The Fragile Mind. My mission as a professor is to “contribute to the success of my students by building a better understanding of my students as learners.” Dr. Conrad’s book not only increased my understanding of the students with whom I interact with on a daily basis, it also gave me insight to my own unsconscious bias. I highly recommend this book to anyone looking for an intelligent perspective on the racial disparities in America.